BbG Communications and P.R. Support - KB Concepts P.R. BbG offers outdoor fitness classes in Arlington and McLean, VA. In addition to being an early supporter and client, KB Concepts has provided communications and P.R. services to BbG since the company’s founding 15 years ago. Results: Under owner Ginny Wright’s leadership, KB Concepts helped grow the company from one group class and a handful of personal training clients to an award-winning and regionally recognized fitness and health leader, offering more than 20 weekly classes and regular nutrition and wellness challenges to almost 200 clients. 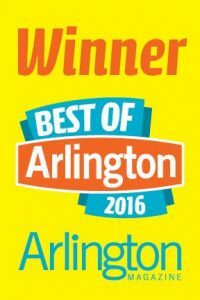 BbG was voted Best Bootcamp — among many other recent awards — in Arlington Magazine’s 2015 and 2016 Best of Arlington annual polls. 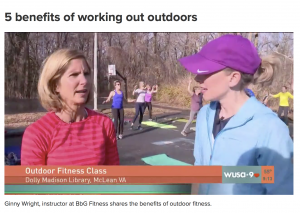 BbG was recently featured in multiple live segments during the entire Great Day Washington morning show about the joys and benefits of year-round outdoor fitness. Ginny also regularly appears on ABC7’s Good Morning Washington, as well as on the top-rated national podcast, Consciously Speaking, to promote her special, sensible and achievable brand of mindful health and wellness. The BBG Total Wellness Challenge is now available nationwide through a specially designed website, expanding BBG’s reach far beyond the DC area. This also allows Ginny to offer it to area employers as an internal wellness program for employees. Nominated by KB Concepts, BbG was also honored with an Arlington Chamber of Commerce Best Business Award. This recognition led to additional local media coverage, as well as Ginny Wright’s column, the Wright Way, that appeared bimonthly in the popular ARL Now blog. In addition to helping Arlingtonians stay fit and strong, BbG actively supports many good causes in the community, including holding regular food drives, volunteering time and providing nutritional advice for the Arlington Food Assistance Center. Since KB Concepts helped BbG mark its 10th anniversary with the first Obstacle Course 5K to benefit AFAC, this has now become a popular annual event for BbG clients and their families. The 2018 event raised a record $8,000 for AFAC.